With the ever increasing popularity of video interviewing, you may have decided to check it out and see what the hype is all about. While video interviews can be extremely helpful when selecting candidates to move forward in the interview process, many first time interviewers find themselves wondering how they can be a great interviewer via video. There are several things you can do before conducting any video interviews that will help you have a great interview. 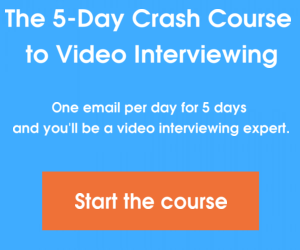 Think about where you plan to conduct the video interview. In your office? In a conference room? In a coffee shop? When you are planning for your video interview, make sure that you are selecting a location that looks professional and has limited distractions. For example, a coffee shop could get a bit noisy, making it difficult for you or the candidate to communicate and concentrate. If you are conducting the video interview in your office or a conference room, make sure that the background which will appear in the video is professional in appearance. If you have piles of boxes, papers, or other clutter in view of the camera, shift these items to another part of the room that will not be in line with the camera. It is also important to make sure that you eliminate any distractions such as employees walking in and interrupting the interview, a ringing phone, or dinging sounds from incoming emails, etc. Be sure and notify your employees that you will be conducting an important video call. You can simply post a do not disturb sign on your office door, letting others know that you are busy. Note: If you typically play music in your office while working, now is the time to pull the plug. It is extremely important that you are focused during the video interview. Unlike a phone interview, the candidate will be able to tell if you are checking emails or attending to other matters. Multitasking is a big NO during video interviews. I have been on video interviews before when the person on the other end of the video seems to be staring down at the floor, making me wonder if they are really focused or paying attention. This is what happens when you are looking only at the computer screen during the interview, rather than looking at the camera itself. While it is natural and completely fine to look at your screen to see the person on the other end of the conversation, make sure your eyes are not always pointed in that direction. By looking into the camera itself when asking questions and responding to the candidate, you are giving the appearance that you are tuned in and greatly interested in the video interview. What are some ways that you have improved your video interviewing skills? Please share your tips and experiences with us in the comments below.